All The Cool Stuff has just announced the third Roll Out/ Roll Call, the UK Fan Show Convention dedicated to Transformers, Action Force and GI Joe - and that one of its star guests will be top US writer Larry Hama, making his first-ever UK appearance. Hama is best known as writer of the Marvel Comics licensed series G.I. Joe, based on the Hasbro line of military action figures. He has also written Wolverine, Nth Man: the Ultimate Ninja, and Elektra. He created the character Bucky O'Hare, which was developed into a comic book, a toy line and television cartoon. Hama had previously pitched a Nick Fury: Agent of S.H.I.E.L.D. spin-off series, Fury Force, about a special mission force, which was then used as the concept for the back-story for G.I. Joe. He included military terms and strategies, Eastern philosophy, martial arts and historical references from his own background. The comic ran 155 issues (February 1982-October 1994). Hama also wrote the majority of the G.I. Joe action figures' file cards; short biographical sketches designed to be clipped from the G.I. Joe and Cobra cardboard packaging. Simon has written literally hundreds of stories about the war-torn ‘robots in disguise’, for Marvel Comics (US and UK), Dreamwave and most recently Transformers: Infiltration, Escalation, Devastation & Revelation, Maximum Dinobots, Beast Wars: The Gathering/The Ascending, Transformers: Stormbringer and Transformers: Spotlight for IDW Publishing. He's currently lead writer and script supervisor for the upcoming animated TV show The Matt Hatter Chronicles. Gold Circle in the US has recently optioned a feature script co-written by Simon and film journalist Mark Salisbury titled Devil’s Due. More guests will be announced shortly. The event will also feature special presentations and panels on the toys, comics and cartoons from special guest presenters, plus show exclusives and trading affiliates, who will be attending the show will show off a host of the latest, and in some cases, unique range of merchandise. Tickets will be on limited availability, so please book in advance to avoid disappointment. Tickets will go on sale soon. The latest issue of British comic news magazine Multiverse is on sale now in all good UK comic shops - and back issues are now also available digitally from graphic.ly. 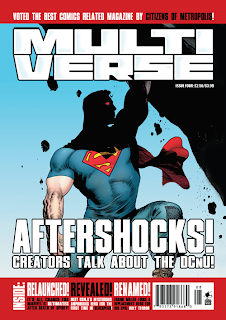 Edited by Mike Conroy, Issue 4 sports a DC Comics revamp-inspired cover, as, inside, Scott Snyder, Paul Levitz, Jimmy Palmiotti and Peter Milligan are among the writers offering their thoughts on the nuDCU. Levitz also joins Roy Thomas, Marv Wolfman, Denny O'Neil and others to discuss comics then and now and their work on the DC Retroactive titles. The issue also includes exclusive interviews with Valiant chief executive officer Jason Kothari, who talks about the plans to relaunch the 1990s powerhouse; the new Ghost Rider creative team of Rob Williams and artist Matthew Clark discuss their incarnation of Marvel's Spirit of Vengeance; and com.X's Bluespear co-writers Andi Ewington and Eddie Deighton and artist Cosmo White offer an insight into their spin-off from last year's Forty-Five while writers Brian Michael Bendis, Nick Spencer and Jonathan Hickman provide an insight into Marvel's reboot of its Ultimate Comics line. We've got some good news about Comic Football, the national subscription-only comic that recently informed subscribers it had been cancelled. 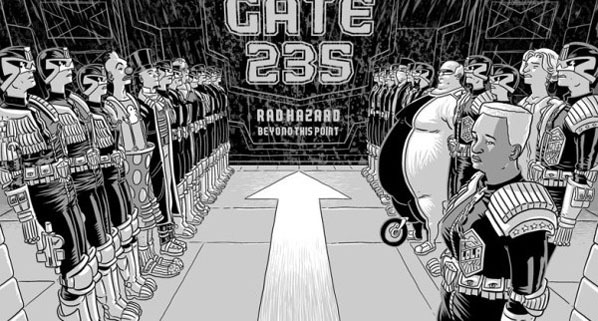 It seems that this is only part of the story - the comic will return later this year, but in a new, free online format. Because of this change of direction, Hinckley-based publishers Comic Football Ltd. stopped taking and have refunded subscriptions for the national version of the comic. It's hoped the digital re-launch as a web comic with a brand new site will happen before Christmas. The new web comic will be constantly updated and free, hence no subscriptions. There's also iPad, Android and Kindle apps in the pipeline, but more about that when it happens. The bottom line for the company is that it's responding to the fast-changing world of publishing, particularly as the move to digital platforms gathers pace. New technologies means the market is changing and nobody is quite sure how to launch a comic these days - or even re-launch one, it seems, in some cases. "They've tried it one way, now they're going to try it another way, and they'll keep on trying until they hit on a sustainable market model," an insider told us. 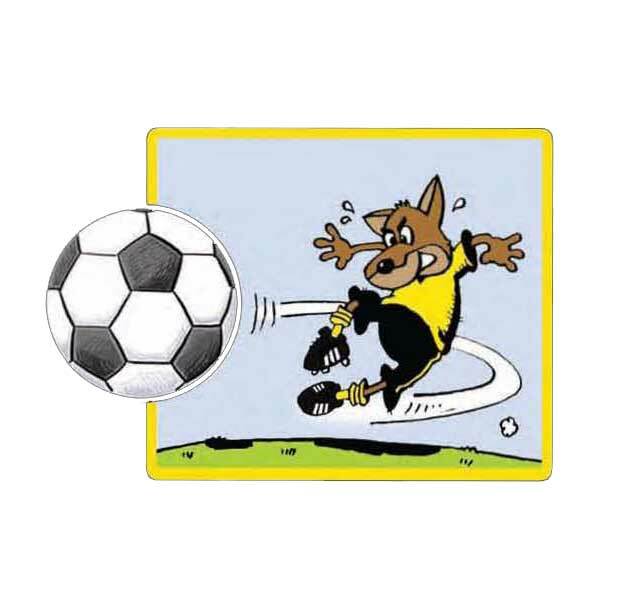 In the meantime, the company's activities producing comics for individual football clubs - their core business - is going very well. They just signed up with Celtic and Doncaster Rovers, and already deliver publications for Manchester City, Newcastle, Stoke City, Wolves, Wigan, Derby County and Aston Villa, with more in the pipeline. 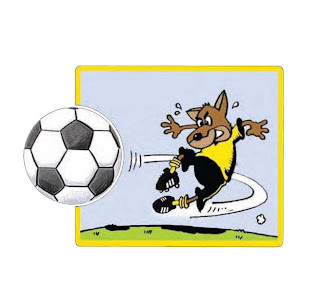 The company's main activities are bespoke comics for junior fans, featuring the club's mascot, club-based comic strips, player or match strips and packed full of features, aiming to be a comic tailored uniquely for a team's junior membership, acting as a marketing and promotional product, or as a retail product for club shops ... or even made available through the local news trade. Alongside dedicated club features, Club Football also offers a catalogue of great characters that can be featured in the comics, aiming to help clubs capture the next generation of fans and give them something exciting in return. Their work is being well received, too. 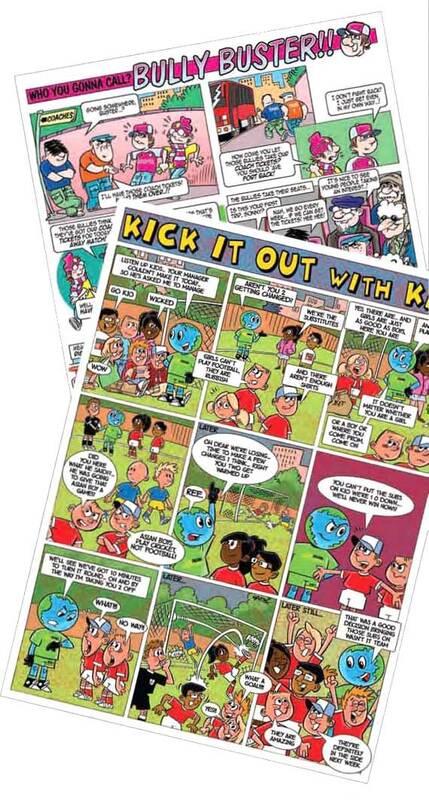 "Comic Football has offered us innovative and well-crafted content that has lit up the junior section of our award-winning Manchester City programme," says Ian Guildford from Ignition Publications. We're also told they're still on the lookout for artists, so submissions are welcome. Regular downthetubes readers will recall we published some features about DC Thomson's much-missed SF digest comic Starblazer on downthetubes some time ago, including a checklist of the title. The section orginally kicked off with a feature by Jeremy Briggs called 'Blazing Through the Secrecy' - pondering the mystery of once-anonymous creators - but also includes background on how the book was created from editor Bill McLoughlin and Ray Aspden's memories of writing for the title ('Behind the Lines'). One thing the section has always lacked was cover images but now, thanks to the kindness of a reader, we have a full set, so we'll be adding them to the checklist over time. But for now, you may enjoy checking them out on this Picasa Gallery. Starblazer featured many covers by Dan Dare artist Ian Kennedy, plus work by artists such as Keith Page, Ferrer, Enrique Alcatena and Jaimie Ortiz and has been reincarnated in recent years as a game, Starblazer Adventures. Hoodie Horror from Smith and Bagwell! The Ravenglade Estate is ‘broken Britain’ as its worse. Plagued by ASBO-wielding gangs, boarded-up shops stinking with human despair, scattered with piles of rubbish from a month-long binmen strike – this is the Daily Mail’s worst nightmare. Cradlegrave - on sale from 13th October - is the ultimate urban horror from the extraordinary mind of writer John Smith and the pen of artist Edmund Bagwell, which first appeared in 2000AD and quickly got fans excited. "I think it was the cover of prog 1633 that did it for me," commented one of the team on Those We Leave Behind. "That got my attention, and what followed from that was TWLB reacquainting itself with that fine institution 2000AD. A joy it is too. "...it is handled with superior skill – the writing of John Smith and the art of Edward Bagwell combine to give you a fully realized kitchen sink drama of a ‘rough’ estate in England with the blurry unease of terror creeping in from the edges. It is nothing less than superb, and I believe will rank amongst the best stories that 2000AD has ever hosted." After serving eight months in a Young Offenders Institute, Shane Holt returns home during a long, hot summer to find that there is something lurking behind the locked doors and the security shutters – something far more rotten than petty drug dealing and larceny. 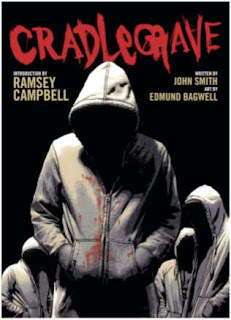 With an introduction from the master of the genre, Ramsey Campbell, Cradlegrave is a classic-in-waiting for modern horror – evil invading not from outside, but from within the mundane, hopeless world of a British ‘sink estate’. 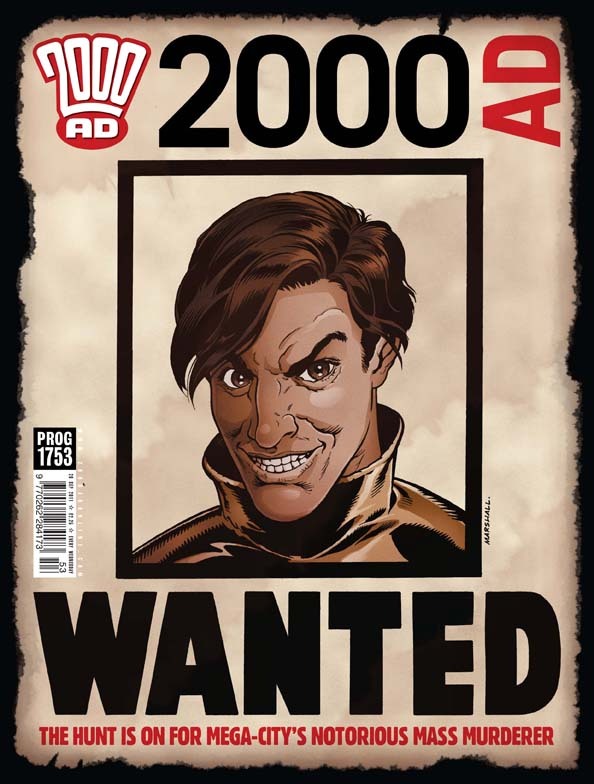 Last month, comics writer Al Ewing (who's writing a series of increasingly regular reviews and musings for the Travelling Man website) gave the thumbs up to 2000AD, urging readers past and present to give it a try. So! I’ve put this off long enough. 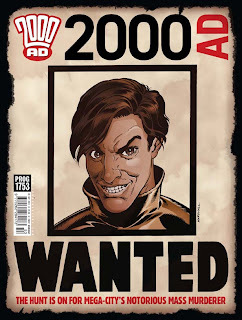 Let’s talk about 2000AD – the UK comic that exploded onto the scene in 1977, kickstarting the careers of dozens of top-flight writers and artists, and is still going strong today. I started reading it when I was nine, and – barring a couple of hiccups – I’ve read it ever since. Around ten years ago, I sent them in a five-page horror story. Now I make my entire living from writing of one sort or another. 2000AD has been very good to me. So excuse me if I get a little evangelical. Now, there are lots of good reasons for not reading 2000AD. You may, for example, be unable to read, although if you’re reading this I’ll assume that’s not the case. You might dislike the medium of comics in general, although again, if you’re here reading this that’s probably not true. Or, possibly, you might have sustained a terrible head injury that’s destroyed certain parts of your brain with the result that every time you enjoy something you violently defecate all over yourself, your immediate surroundings, and the cat. These are all excellent reasons not to read 2000AD. However, if you can read, if you like reading comics and if you like enjoying things, you really should try it. For a start – it’s a deal, it’s a steal, it’s the sale of the century et cetera. If you’re in the UK – or on the internet – it’s cheaper than just about any American comic, and you get more and bigger pages of story. And the savings don’t end there! Because individual episodes are usually around five pages long, there’s literally no room for padding. So you get more story per page compared with your favourite American comic too. Case in point – the current run of 'Low Life', a strip set in the world of Judge Dredd and dealing with Justice Department’s undercover agents. Rob Williams, on script duties, is busy crafting one of the greatest stories of his career, bringing new depth to his great comedic creation Dirty Frank as the undercover Judge explores the underbelly of a future Tokyo in search of a missing fellow officer. I hope Rob will forgive me for saying that – while I love all his work – 'Low Life' is, in my opinion, his best. Every panel – every line of dialogue – is packed with intelligence, life, heart and soul, and any fans of his, or of good writing in general, need to be reading it. Matt Brooker – alias D’Israeli – is on art chores, and as usual his elegant, emotive, perfectly composed clear-line style knocks every page out of the park. I don’t know why the Big Two aren’t fighting each other in some kind of Octagon for his services, but their loss is 2000AD‘s gain. Words can’t describe how good his art is, so let’s pay a quick visit to his blog, where you’ll find many posts dedicated to his painstaking process – this one is a nice introduction to the kind of beautiful vistas on display in the strip. That’s one story, out of five. In addition, in the latest crop of stories – the first prog of which, 1750, is available digitally from the 2000AD website, and 1753 is now on sale at the better newsagents, or (cough) at your local Travelling Man – you have top cop and future film sensation Judge Dredd, at the seasoned hands of creator John Wagner and Henry Flint; stiff upper-lipped paranormal investigator Ampney Crucis, by Ian Edgington and Simon Davis; the unfolding mystery of Angel Zero, by Kek-W and John Burns; and the mind-exploding, reality-warping strangeness and charm of Indigo Prime – yes, it’s back at long last – by John Smith and Edmund Bagwell. And, sooner or later, I’ll be back in the prog myself. But I’m not just shouting 2000AD to the rooftops because I’m in it – I’m promoting it because I love it, because it does astonishing things that other comics can’t, because it fosters incredible talents that other publishers won’t, because week in, week out, after thirty-five years, it’s still the Galaxy’s Greatest Comic. • If you're a comic creator and would like to write a Guest Post for downthetubes on some aspect of British comics, please get in touch. 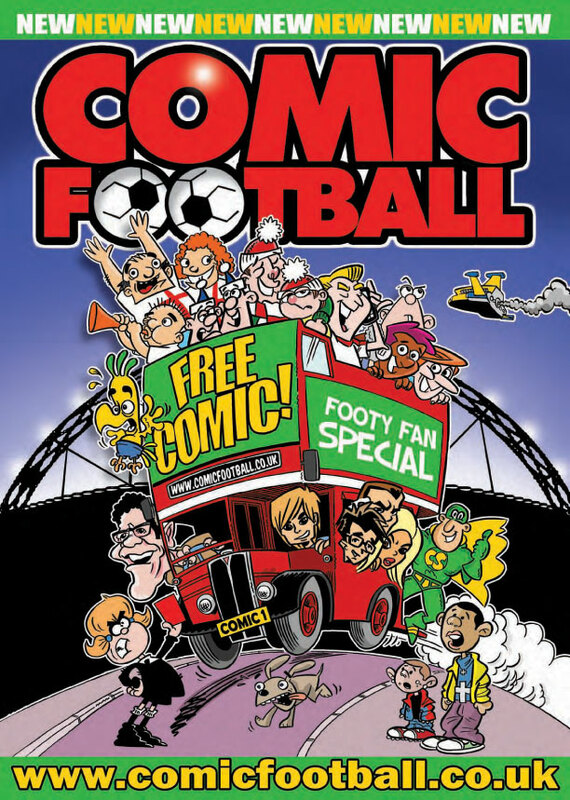 (Updated 13:24 4/10/11) We're sorry to report the demise of Comic Football, the subscription-only title - after just three issues. Subscribers have just received a letter advising of the title's "temporary suspension" and the return of any subscription money owed - but the letter holds out the promise that the comic may return in future. Comic Football was launched earlier this year by Hinckley-based publishers Comic Football Ltd. and featured strips by artists such as Karl Dixon, Nick Brennan and Duncan Scott. launches.html">see 2008 news story). The company now publishes several club-specific comics, including titles for Manchester City and many others in the Premier League. As well as being on sale at grounds, these have limited distribution in local newsagents where the clubs are based. As we reported back in June, Comic Football was planned as a more general purpose football comic, available only by subscription. A subscription to Comic Football cost £9.99 for six months (six issues) or 12 months for £19.50. 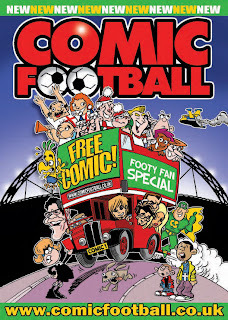 The title's web site (www.comicfootball.co.uk) has yet to announce the title's demise. See also: Crystal Knights: Comic Football: Supsended! 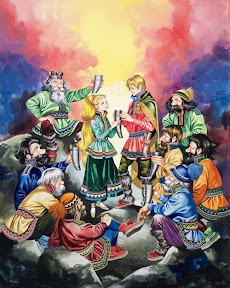 One of our most popular and talented artists, Ron Embleton - whose work is getting major promotion this month over at the Book Palace web site's Illustration Art Gallery - began drawing as a young boy, at 12 winning a national poster competition. At 17, he earned himself a place in a commercial studio but soon left to work freelance, drawing comic strips for many of the small publishers who sprang up shortly after the war. He was soon drawing for the major publishers. His most fondly remembered strips include 'Strongbow the Mighty' in Mickey Mouse Weekly, 'Wulf the Briton' in Express Weekly, 'Wrath of the Gods' in Boys’ World, 'Tales of the Trigan Empire' and 'Johnny Frog' in Eagle and 'Stingray' in TV Century 21. Embleton also provided the illustrations for the title credits for the Captain Scarlet TV series, and dozens of paintings for prints and newspaper strips, including 'Snow White', 'Beauty and the Beast', 'Wicked Wanda' and 'The Magic Apples'. A meticulous artist, his illustrations appeared in Look and Learn for many years, amongst them the historical series Roger’s Rangers.